This schedule is subject to change, based on a variety of factors. Nevertheless, we can project a tentative schedule for the next several years. Most of our extended workshops and colloquies gather for 3 sessions: a week in successive summers with a weekend gathering in January on the South Texas beach. 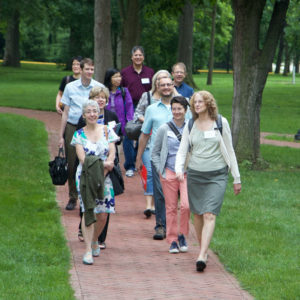 Each summer we start a new Workshop for Early Career Faculty in Theological Education. This holds true for the Workshops for Early Career Religion Faculty at Colleges and Universities (undergraduate education) — except every third time we skip a year. 2020-21 Colloquy for Mid-Career Religion Faculty at Colleges and Universities. Applications are typically due January 15th. New programs are usually announced each October. Follow us on Twitter or Facebook or sign up for our Sign up for our newsletter to receive timely announcements of Wabash Center programs. Since 2001, we have offered these workshops on a rotating basis. We occasionally convene invited groups for conversation on topics of pressing concern. We offer successive colloquies on a rotating basis for mid-career faculty and administrators, typically focused on a particular issue or challenge. 2020-2021 Colloquy for Mid-Career Religion Faculty at Colleges and Universities. Our Preparing Future Faculty initiative gathers doctoral programs every other year for a day-and-a-half conversation about preparing graduate students for careers as teachers. Our next Graduate Program Conferences are projected for Fall 2018 and 2020. See as well our Doctoral Student Seminars. Workshops series are planned for the 2017-18 academic year in the Boston and New York regions.